In some casino games the element of luck is the most important thing. Even for those games you have to know the rules and some things about bonuses and other special features. With some other games, like Blackjack, the strategy becomes more important; although the luck is still something you cannot count on every time. You have to place your bet even before you see your hand - your two cards, upon which you have to make your decisions. Well, not exactly - you can also see one of the dealer's cards, you can see all the cards the other players have, and you have to base your decision according to that, also. For example, if you have, let's say 18 in your first 2 cards, and you can see that all the other players have face cards, including the dealer, with no Aces, you have higher chances for getting the small card or an Ace. Anyway, if you consider all the other cards, you can plan your decision accordingly. In multiple card deck Blackjack the house average edge is 0,5%. That means the players will lose 5$ on every 1000$ bet. When we are talking about surrender option, where the dealer keeps one half of your bet when you decide to use the option, the house edge is about 7%. As you can see, it is significantly higher percentage. We can draw the conclusion from it - to use the option reasonably. There are different rules for the dealer - in some casinos he is not allowed to draw any more cards if he has 17, or "soft 17". In some other casinos he can take one additional card, and that increases the house edge for additional 0,2%. 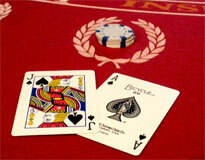 Our advice is to pick those casinos where there is no such option for the dealer. There is also a question of payouts. In some casinos you will get 1,5:1 for the natural blackjack, but in some of them the payout will be 1:1. Although they are offering some additional bonuses, you have to calculate your odds accordingly. There are some different versions of the game - in Spanish Blackjack there are no 10s in the deck, but the odds are higher. This game demands different strategy.